Mezzanine chipboard has tongue-and-groove joints on four sides. These boards are particularly well suited for structural, industrial applications in dry conditions. Mezzanine is especially strong and can bear extreme loads. The boards’ exceptional sturdiness also permits the storage and transportation of heavy materials. 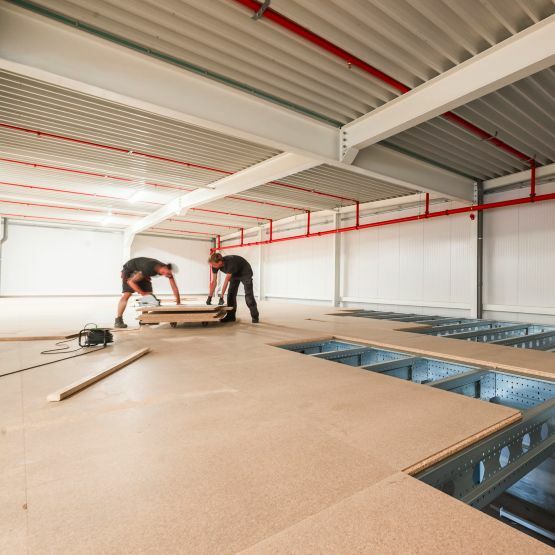 Mezzanine floors are a very quick and cost effective way to create new space without the expense and inconvenience of relocation and can be installed in virtually any environment and location. Meyer offer a range of P5 (Moisture Resistant) and P6 flooring chipboard panels from UNILIN which can be supplied in a number of different finishes. As an alternative to 38mm particleboard we also stock the OSB4 HDX panel from EGGER which is ideal for heavy duty load bearing environments such as mezzanine flooring, racking, shelving, working platforms and decking, where P5 or P6 38mm particleboard would typically be used. Due to being only 30mm thick, Egger OSB HDX is around 20% lighter, making it easier to manoeuvre and quicker to lay. Our range of FSC® certified mezzanine flooring panels are all manufactured in accordance with EN312:2003 and are available with no minimum order and for next day delivery.